A few days ago we reported on several major leaks of unreleased TV-shows. This included several episodes from the Starz original show "American Gods". Apparently, however, Starz didn't like our news reporting. To stop it from spreading any further, a representative asked Twitter to take down our tweet, stating that the article in question infringes its copyrights. 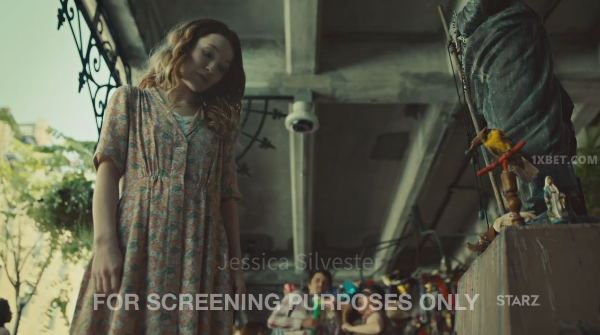 For the record, our article only includes a single identifiable frame from a leaked “American Gods” episode, to show the screener watermarks, which are central to the story. That’s just 0.001% of the episode in question, without audio, which is generally seen as fair use, especially in a news context. 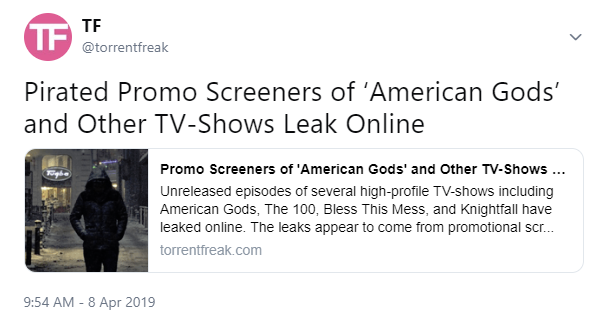 As for the claim that the article includes information about the shows’ “illegal availability”, we only mention that they are being shared on pirate sites, without giving any names or links. That’s no ground for a takedown request. Luckily, our analysis is backed up by Kit Walsh, who’s a Senior Staff Attorney at the Electronic Frontier Foundation. “Starz has no right to silence TorrentFreak’s news article or block links to it. The article reports that there are people on the Internet infringing copyright, but that is a far cry from being an infringement itself,” Walsh says. “The screenshots are important parts of the reporting that validate the facts being reported. Starz should withdraw its takedown and refrain from harassing journalists in the future,” she adds. As for Starz attempt to ‘silence’ our reporting. This turns out to be quite counterproductive. Without their takedown notice, we probably wouldn’t have brought up the leaks again. We have reached out directly to the Starz representative who sent the DMCA notice to request comment and further information. At the time of writing, we have yet to hear back. If Starz doesn’t withdraw its takedown notice we will consider appropriate follow-up steps. In the meantime, anyone who’s interested in learning more about the TV-show leaks can find our news report here.